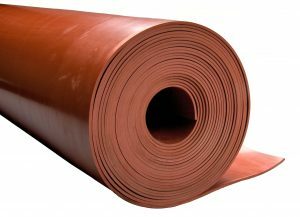 SBR red rubber (styrene-butadiene rubber) is a general purpose rubber sheet material often used for gasket and sealing applications where oil resistance is not needed. Offered in 36 and 48 inch wide rolls, it can also be slit to width or custom cut to your specifications. Also available in 72 inch wide rolls in some sizes (specs may vary on 72 inch wide rolls, please inquire). Red SBR offers a high tensile strength and high durometer (hardness) for a durable firm sealing material.